DESCRIPTION -- Silver-plated spoon from the vessel HMS Malaya which is in a very good condition and the size is 5" (13cm) long showing the company houseflag at the end of the spoon (click on the picture to see a closer view of the houseflag). HISTORY -- HMS Malaya was a Queen Elizabeth-class battleship of the British Royal Navy, built by Sir W. G. Armstrong Whitworth and Company at High Walker and launched in March 1915. She was named in honour of the Federated Malay States in British Malaya, whose government paid for her construction. DESCRIPTION -- Postcard sized photograph of the Royal Naval ship HMS Hermione which is in an excellent condition. 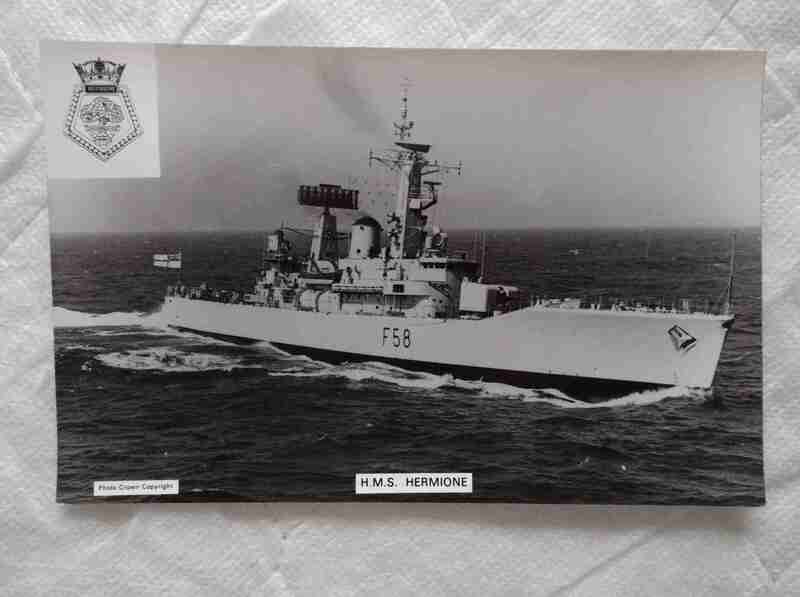 HISTORY -- HMS Hermione (F58) was a Leander-class frigate of the Royal Navy (RN). She was, like the rest of her class, named after a figure of mythology. Hermione was built by Alexander Stephen and Sons, though she was completed by Yarrow Shipbuilders. She was launched on 26 April 1967 and commissioned on 11 July 1969. 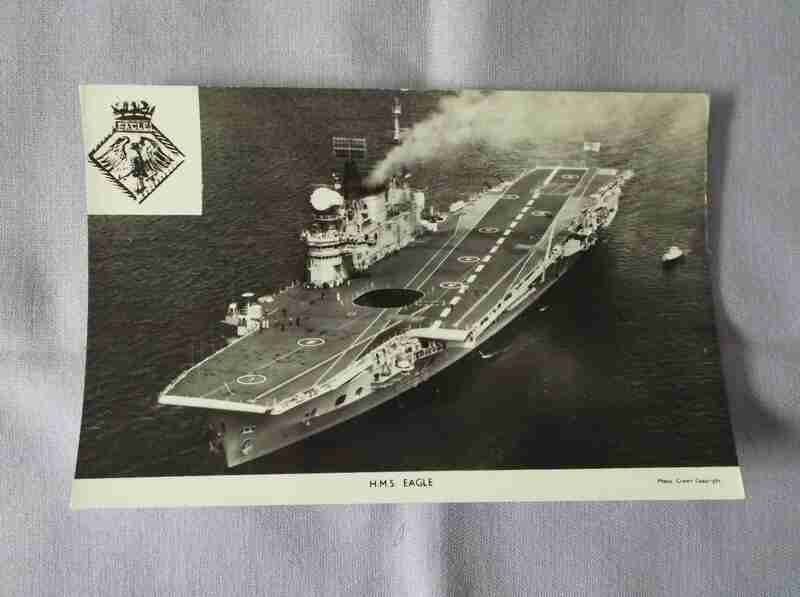 DESCRIPTION -- Postcard sized photograph of the Royal Naval ship HMS Eagle which is in an excellent condition. HISTORY -- HMS Eagle was an aircraft carrier of the Royal Navy, in service 1951'1972. With her sister ship Ark Royal, she was one of the two largest Royal Navy aircraft carriers yet built. 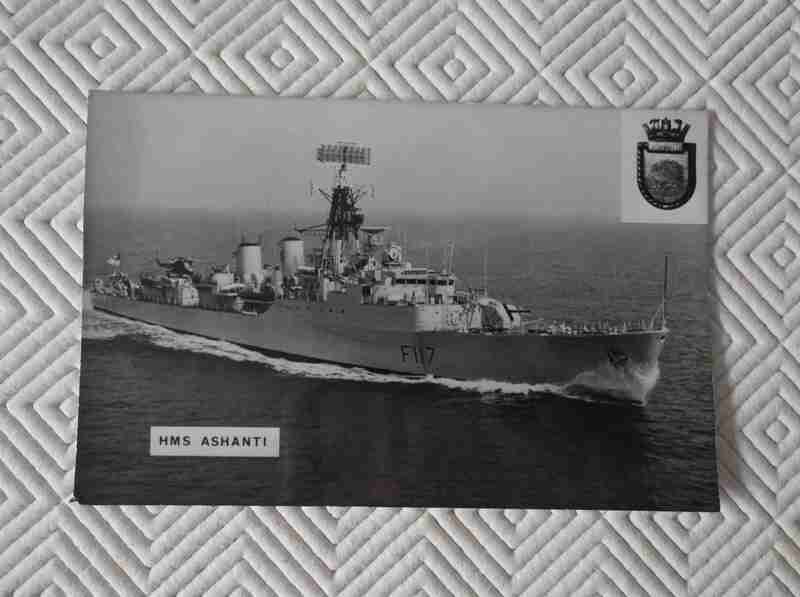 DESCRIPTION -- Postcard sized photograph of the Royal Naval ship HMS Ashanti which is in an excellent condition. 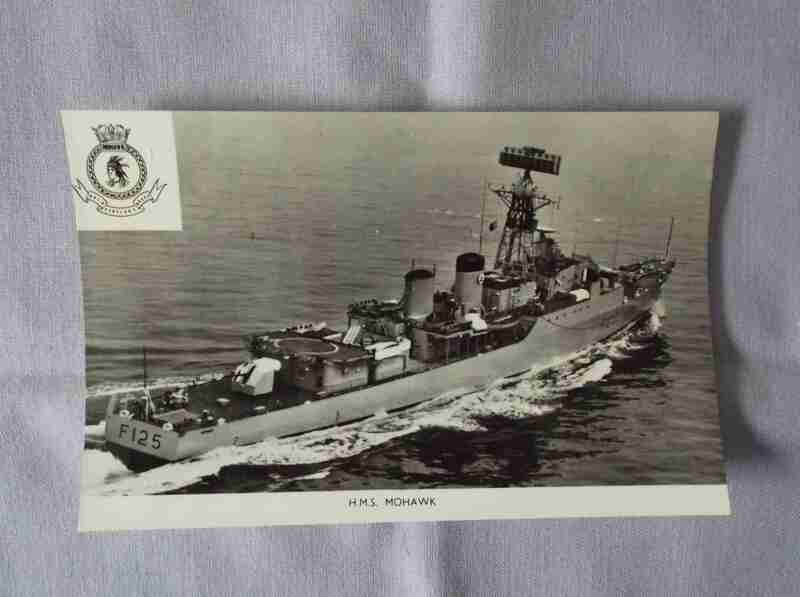 DESCRIPTION -- Postcard sized photograph of the Royal Naval ship HMS Mohawk which is in an excellent condition. HISTORY -- HMS Mohawk was a Tribal-class frigate of the Royal Navy in service from 1963. She was named after a tribe of Native Americans located in southeast Canada and New York State. Mohawk was scrapped in 1983. Mohawk was built by Vickers, of Barrow-in-Furness, at a cost of 4,705,000. She was launched on 5 April 1962 and commissioned on 29 November 1963. Her construction had been disrupted by a labour dispute. DESCRIPTION -- Small scale model of the old Royal Naval vessel the HMS Prince of Wales which is in a great condition and the size is 7" (18cm) long (click on the picture for a close up of the model). HISTORY -- HMS Prince of Wales was a King George V-class battleship of the Royal Navy, built at the Cammell Laird shipyard in Birkenhead, England. She was involved in several key actions of the Second World War, including the battle of Denmark Strait against Bismarck, operations escorting convoys in the Mediterranean, and her final action and sinking in the Pacific in 1941. DESCRIPTION -- Old keyring from the Coastal Defence Monitor Vessel HMS Cyclops, which was in service from 1877-1903 which is a souvenir from the vessel and is in a very good condition. HISTORY -- HMS Cyclops was the lead ship of the Cyclops-class breastwork monitors built for the Royal Navy during the 1870s. The ships were ordered to satisfy demands for local defence during the war scare of 1870, but the pace of construction slowed down tremendously as the perceived threat of war declined. The ship spent most of her career in reserve; her only sustained period in commission was four months in Portland Harbour, during the Russo-Turkish War in 1878 when the British were trying to force the Russians to end the war without allowing them to seize Constantinople. Cyclops was sold for scrap in 1903. 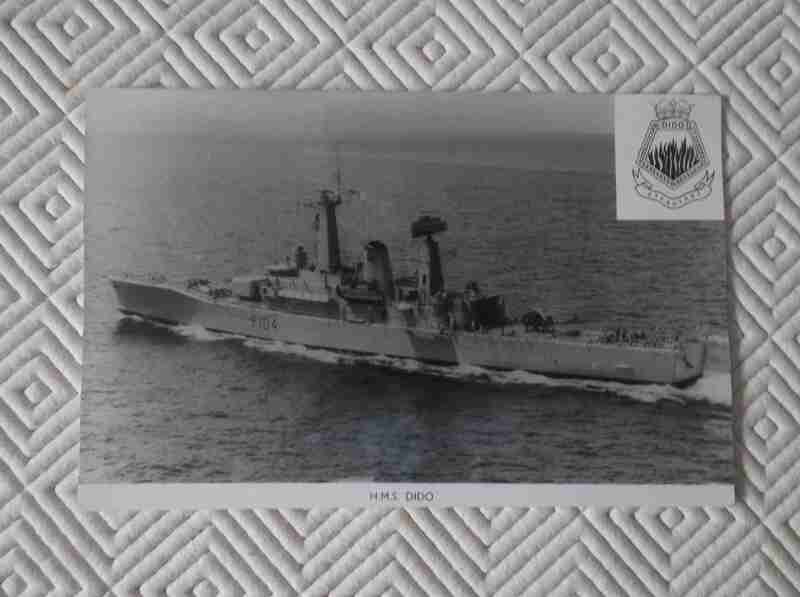 DESCRIPTION -- Postcard sized photograph of the Royal Naval ship HMS Dido which is in an excellent condition. HISTORY -- HMS Dido was a Royal Navy (RN) Leander-class frigate. Entering service in 1961, Dido was involved in the Indonesia-Malaysia confrontation, served with NATO's Standing Naval Force Atlantic on several occasions, and was one of the frigates used for the filming of the drama series Warship. Following a defence review at the start of the 1980s, the ship was transferred to the Royal New Zealand Navy (RNZN), and was recommissioned as HMNZS Southland. Southland remained in service until 1995. DESCRIPTION -- Small scale model of the famous old Royal Naval vessel the HMS Hood which is in a great condition and the size is 8" (20cm) long (click on the picture for a closer look at the model). HISTORY -- The 'mighty' Hood was the pride of the British Navy for more than 20 years, revered around the world as the largest and most powerful warship afloat. But when it was sunk by the German battleship Bismarck off the coast of Greenland on 24 May 1941, its end was shockingly swift. For decades, no one has been able to discover why the Hood sank so quickly and two official Boards of Inquiry investigated but failed to explain the tragedy. DESCRIPTION -- Souvenir spoon from the Royal Naval vessel the HMS Hermes which is in a great condition and the size is 5" (13cm) long (click on the pisture for a close up of the item). HISTORY -- HMS Hermes was a conventional British aircraft carrier and the last of the Centaur-class. Hermes was in service with the Royal Navy from 1959 until 1984, and she served as the flagship of the British forces during the 1982 Falklands War. After being sold to India in 1986, the vessel was recommissioned and remains in service with the Indian Navy as the INS Viraat.